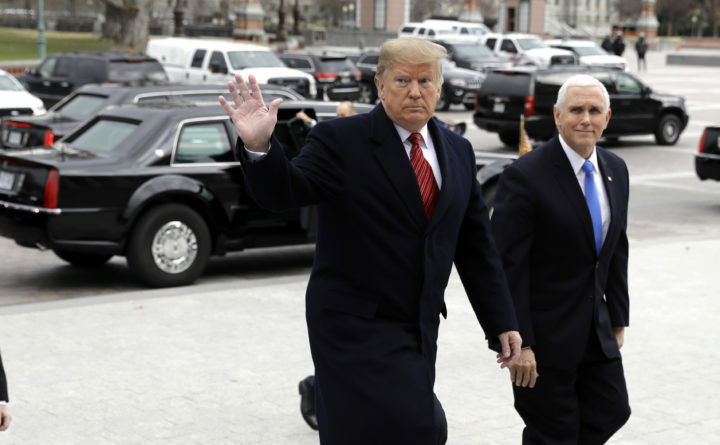 President Donald Trump arrives with Vice President Mike Pence to attend a Senate Republican policy lunch on Capitol Hill in Washington on Wednesday. Rep. Eliot Engel, D-New York, the chairman of the House Foreign Affairs Committee, said in an interview that his panel will form an investigative subcommittee whose targets will include seeking State Department records of Trump’s encounters with Putin, including a closed-door meeting with the Russian leader in Helsinki last summer. Washington Post writers John Hudson, Josh Dawsey and Julie Tate contributed to this report.